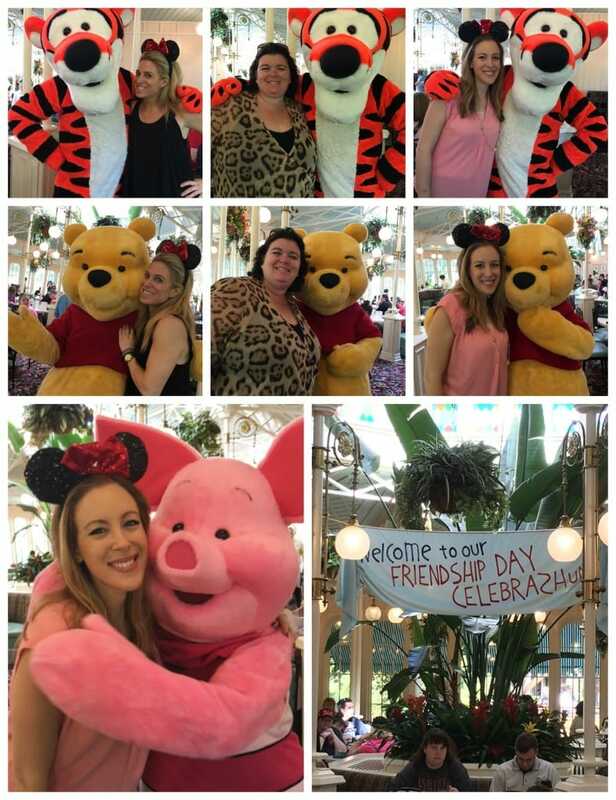 Can you believe that when I visited Magic Kingdom last month, it was on Friendship Day? And I was there with all my friends! What?! Amazing!!! 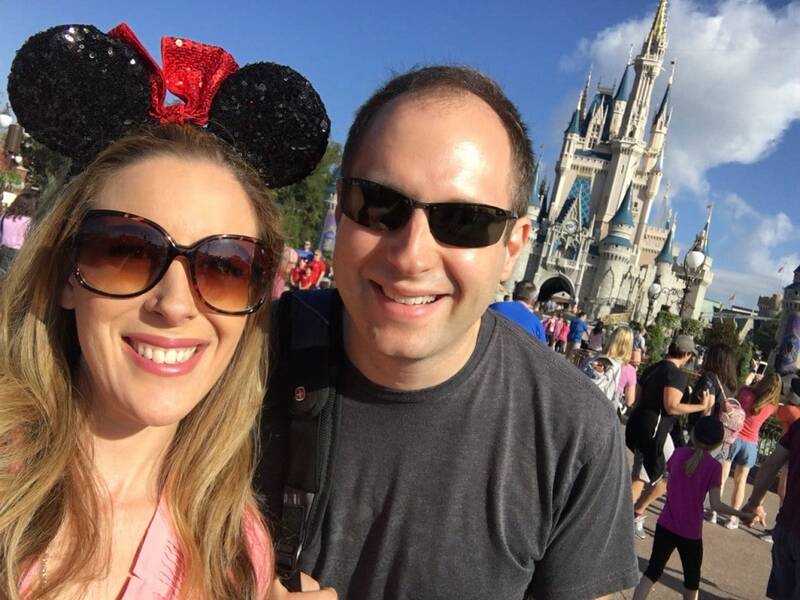 I flew down to Orlando to attend a press junket for Zootopia and had the chance to spend a full day at Magic Kingdom in Disney World. Total MAGIC! In case you are planning an upcoming trip with your family, I wanted to put a few things on your radar. Character Dining: I highly suggest you make reservations ahead of time. I know – I’m really not that kind of girl either. But, you will thank me later. 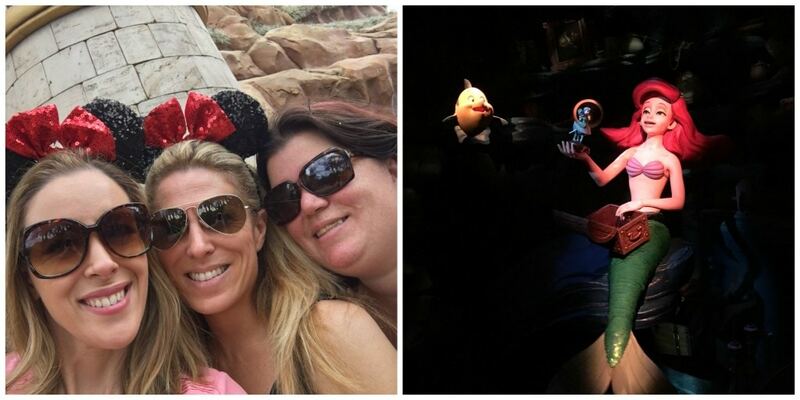 Click here to see all the character dining options that are available for the Disney Parks. 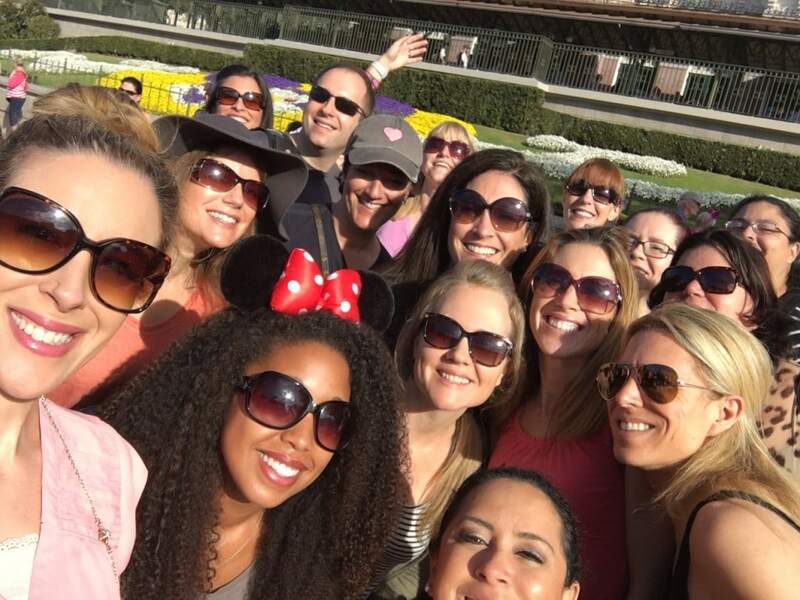 You will see availability at both the parks and the hotels which makes it really easy and convenient. 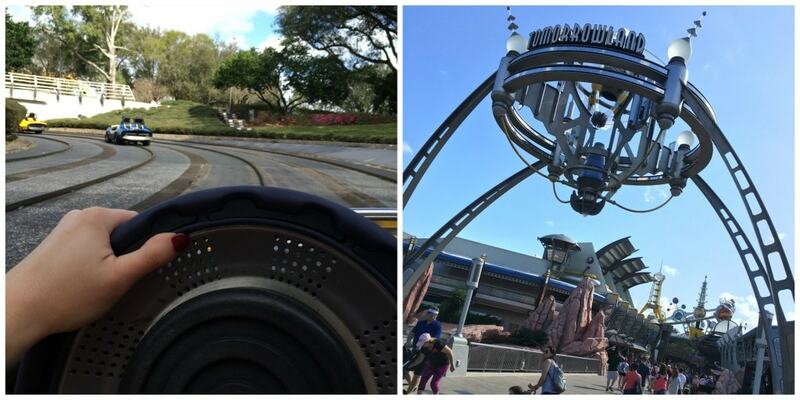 Speedway in Tomorrowland: My children are OBSESSED with this ride because they get to actually “drive” a car. Trust me, the line goes a lot faster than you think. Disney really does buffer those wait averages. I drove this ride and Facetimed my kids while I was doing it because I knew that they would really get a kick out of it. The Little Mermaid ~ Ariel’s Undersea Adventure: Ok, this one you will want to use a Fast Pass on because the wait is usually around 60 minutes. It’s one of Disney’s newest rides and I can’t help but sing the entire way through. I’m not kidding. I am BELTING OUT SONGS the entire way. I’m not shy about it either because it’s dark and people really don’t know where it’s coming from. Look at this stuff… isn’t it neat!!??? 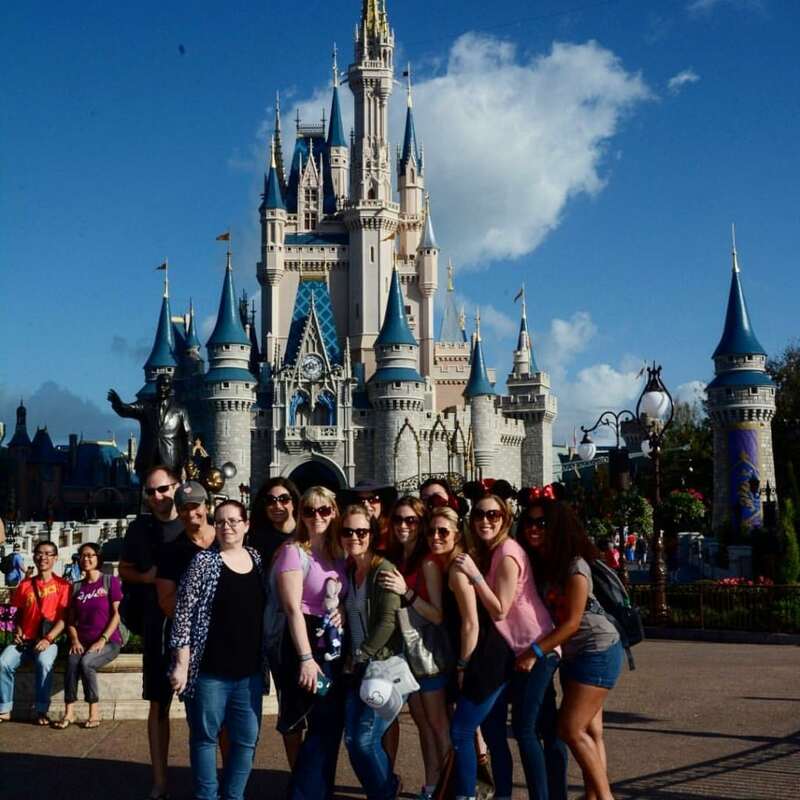 Obligatory Entry and Castle Photos: I mean… do I need to say more? It’s absolutely mandatory. 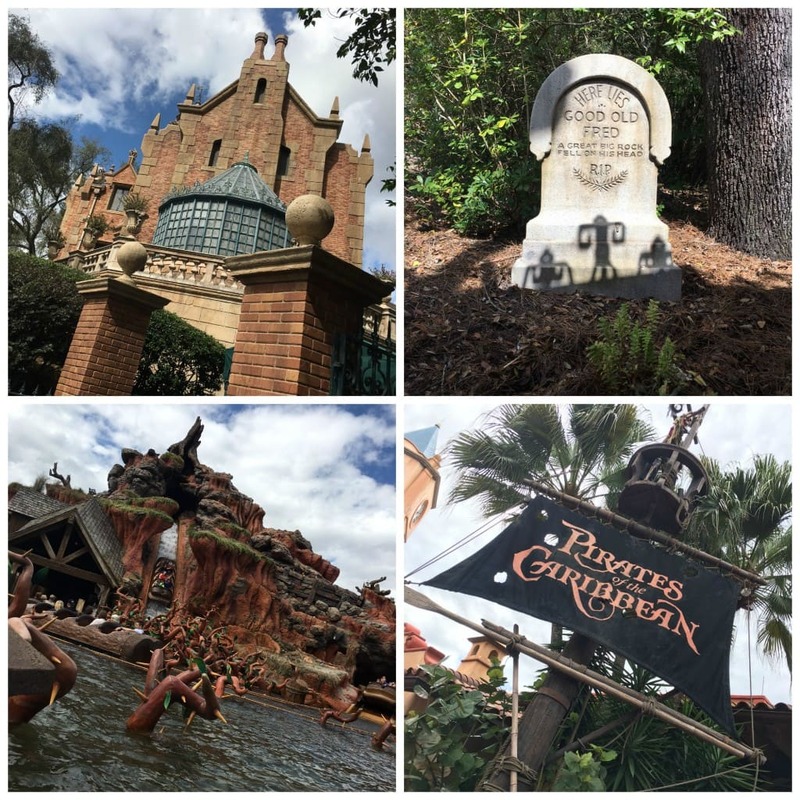 Rides That Get Your Heart Pumping: There are so many to choose from including – Pirates of the Caribbean, Splash Mountain, Haunted Mansion and…. 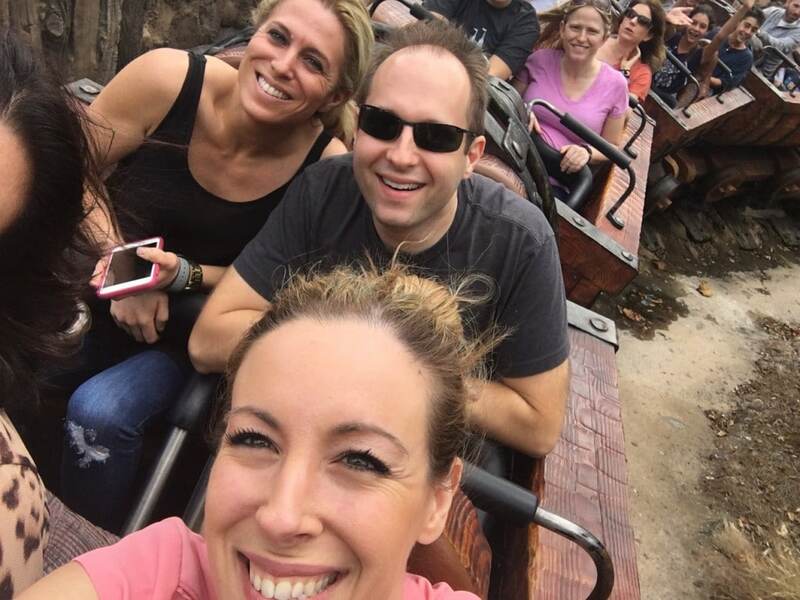 Now… somehow… I don’t know how it happened… but I FILMED THE ENTURE MINETRAIN RIDE WITH MY PHONE. WHAT??? Want to see it in action? Check out the film below! I tried to get the entire train, but it ended up just being all about Marshall. He should pay me for my services… honestly. Dole Whip: Ok, listen to me. This is the only reason to live. Actually, I take that back because I don’t want to oversell this and then you eat the ice cream and you are like… meh. So, instead of telling you that Dole Whip is the only thing I think about on my flight down to Orlando every single time I head to Florida, I’m going to say that you should absolutely try this frozen treat. There are two ways to get it — with Pineapple juice and without. Rumor has it you can also get it with rum. Holla! I don’t know where you can do that though??? 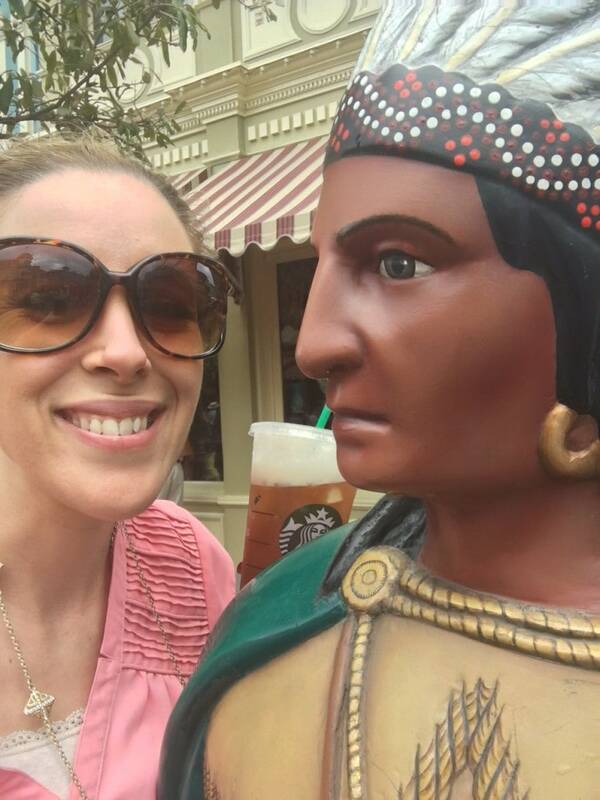 The stand is in Adventureland by Aladdin. 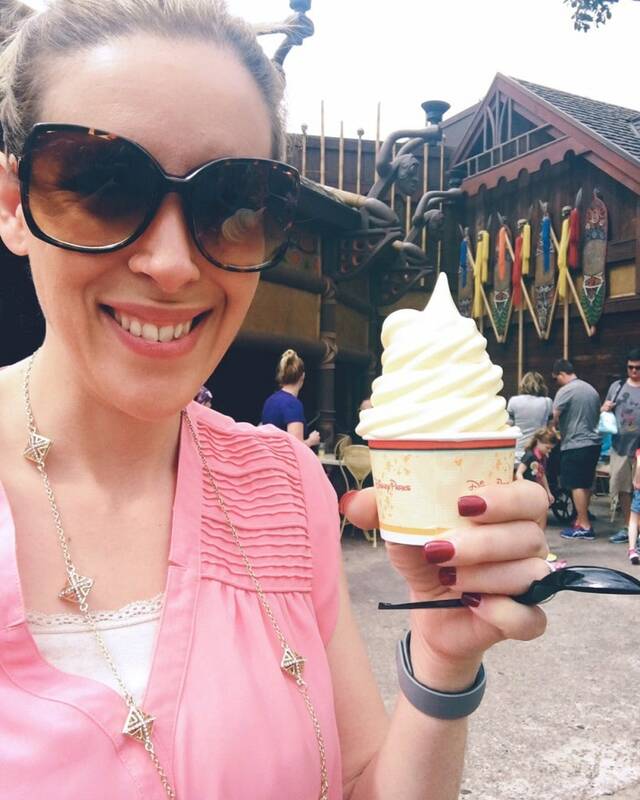 Ask anyone that works in Disney where to find Dole Whip and they will guide you. WORTH IT. I don’t care if you are a on a cleanse or if you are trying to cut down on sweets or if you are sort of sensitive to dairy… it’s WORTH IT. And What About The Simple Memories? And what will this all lead to??????? 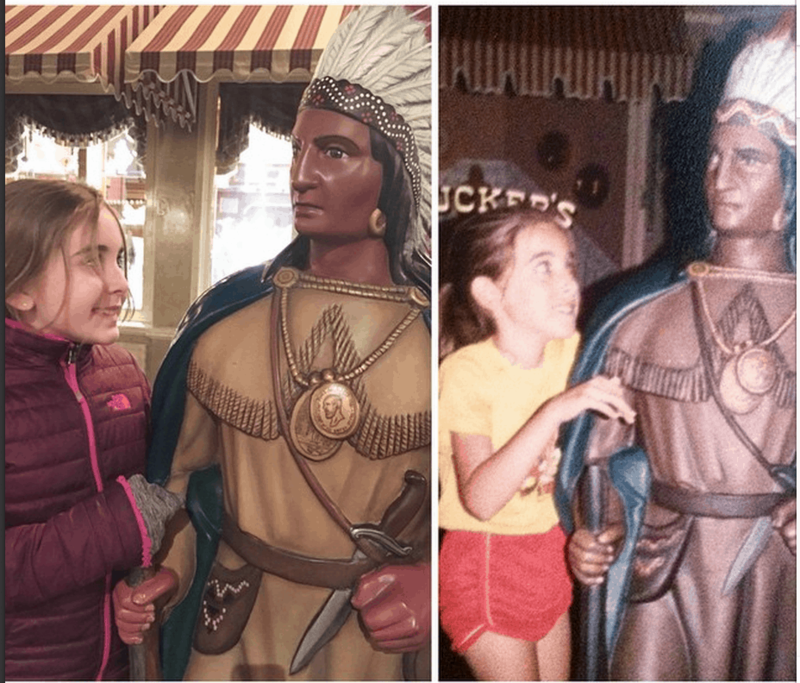 Memories: I wrote about this picture showing me and Natalie around the same age hanging out with my favorite Native American statue last year. You can read about it here. I actually can’t start to remember that post because it makes me want to cry. 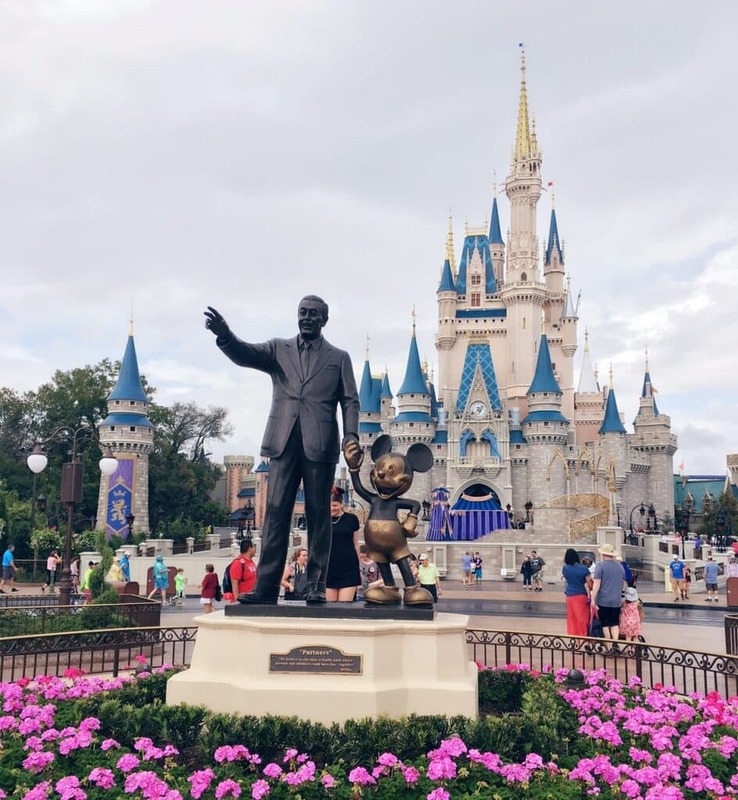 My father isn’t in my life and my one and only Disney trip when I was younger was because my parents divorced and my grandfather wanted to do something special for me. That trip brought so much joy to me during a time that was so dark. And now, so many years later – with him nowhere to be found – whenever I step foot in the park – I remember what it did for me as a child. Maybe that’s why I love it so. But having a child of my own, and being able to bring her to the park and share my childhood memories with her… it’s priceless. I love telling her about all the fun things I loved doing when I was 7 and running around in the park. I love making her pose like I did in the 80s. I love that we look so much alike. And when we go down together, we try to repeat those things again and again. It’s our tradition. Disney really does have such special meaning to me. Meanwhile, I guess you don’t have to click on that link because I pretty much summed up that story and I’m crying – so there. So… yeah. I love Disney. OBVS! Don’t Forget To Watch Zootopia! I hope you check out some of my ideas and then make up new adventures of your own. And while you are on a break, be sure to check out Zootopia while its in theatres. SUCH a good movie!! * Disney invited me to attend the press junket for Zootopia. All opinions are my own.